The moving process can be stressful and Booth Movers is ready to help with all of your storage needs throughout the relocation process. If you are looking for New Jersey household storage services to give you some extra time when moving, we offer short and long-term storage solutions that can be customized to suit your needs and budget! Our New Jersey household storage company has an A+ rating through the BBB, and we are proud to offer secure storage options at our 32,000-square-foot warehouse facility. 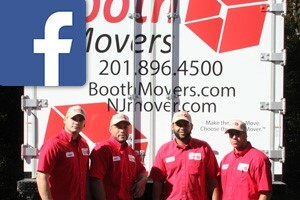 Since the 1940s, Booth Movers has led the industry in quality household storage and moving services. Our commitment to customer service is evident in every aspect of our business, and we will work with you to ensure that every one of your residential storage needs are met then exceeded. Residential Moving – Whether you are going down the street or around the globe, our experienced New Jersey movers are capable of handling residential relocations of any size. Household Moving – Booth Movers offers full-service household moving services that can be customized to suit any relocation, regardless of scope. Local Moving – For local moves around Bergen County, nobody knows the area better than our expert New Jersey residential movers! Long Distance Moving – Take the stress out of planning your long distance relocation by having Booth Movers coordinate all the details. International Moving –Booth Movers is the premier New Jersey moving company to navigate you through the process of international relocation. For the best in New Jersey household storage, there is no better choice than the professionals at Booth Movers! To find out more about the short and long-term options available, give us a call or fill out our simple online form today!